Beeks Downunder-Because not all financial news is boring! | An Aussie look at Financial markets-Been in the Biz for over 30 years! HAPPY EASTER! Its like Xmas without the pressure! !Much better. ASX 200 rises 3 to 6260 as SPI futures expiry bumps volume before Easter break. US futures fall 75 points. Banks started well but after a dip closed unchanged after NAB announced another $525m in remediation costs.The stock rose 0.2% Miners tried to hold the line but apathy got the better of them, as healthcare stocks slipped with CSL -1.3%. Plenty of quarterly reports out today including WPL up 1% and S32 down 0.6%. TLS up 1.5%, continue to grind higher as a viable alternative to banks. Kogan punches the lights out with a 18.6% rise after a business update. Defensive REITs came under a little pressure with GMG down 0.4%. On the economic front, unemployment jumped to 5% with the participation rate soaring 0.1% giving both parties reasons to crow. 8 days into campaign . Are we there yet? AUD steady at 71.81c. ASX pretty much unchanged for the week. Up 8 points. ASX 200 rises 4 points to 6260. SPI Expiry pumps volumes. High 6280 Low 6248. Unchanged for the week. Banks stage late rally with healthcare under pressure. NAB takes another hit. Jobs numbers take some gloss off. Unemployment rises to 5%. Aussie Gold slips again to $1771. US futures down 73 ahead of Mueller report. Asian markets weaker with Japan down 0.86% and China down 0.27%. KGN +18.63% business update and deal with ECX. Time to take some profits. GNC -2.23% trade tensions bite. BUB +10.13% strategic deal with Chemist Warehouse. WHC +6.44% QLD project gets a tick from the government. TWE +3.14% bread and wine stocks get Easter boost. GXY -11.62% fails to find a suitable suitor for South American project. AWC -3.28% Alcoa results disappoint. Speculative Stock of the Day: Next Science (NXS) +35.00% new IPO debuts at a good premium. $35m raised for a valuation of $179m at listing.NXS has a technology which is a non-toxic biofilm based on free-floating bacteria which can be used in wounds and skin trauma. Mmm. National Australia Bank (NAB) +0.12% this morning has announced another $525m in additional provisions. This will reduce 1H19 cash earnings by $325m and earnings from discontinued operations by another $200m. Kogan (KGN) +18.63% Q3 trading update. 23.4% increase in active customers up to 1.59m. Revenue up 9.5% on last year, however operating costs also rose 4.4%. Gross profit up 28.4%. The company is also partnering with Eclipx (ECX) to launch Kogan Cars later this year. Bubs Australia (BUB) +10.13% have signed a contract with Chemist Warehouse to sell products in-store and online nationally via its domestic and Chinese Tmall online stores. Chemist Warehouse has purchased 49,426,508 Bubs shares over the last three years. HUB24 (HUB) –1.69% Record net inflows for the March quarter of $793m, up 33% on year. FUM at the end of March came in at $11.5bn. St Barbara (SBM) +0.32% Third quarter production -0.9% on the December quarter to 88.4Koz at AISC of $1098 per ounce. GMX optimised trucking solution extends Gwalia mine life to FY31. FY19 Simberi production guidance increased. $382m cash at bank with no debt after paying 4c per share interim dividend. Woodside Petroleum (WPL) +0.99% Q1 production report. First quarter production of 21.7MMboe, down from 22.2MMboe a year ago with product sales down to 21.7MMboe from 23.0MMboe. 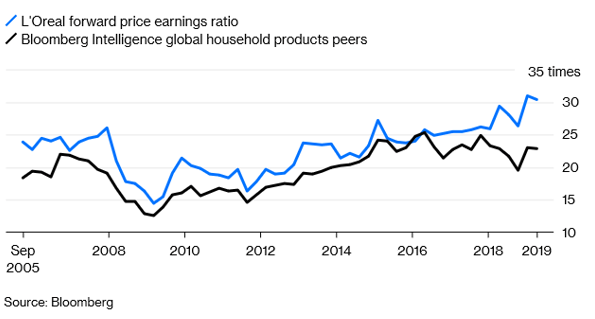 Average realised price up to $56/boe from $51/boe a year ago. Fortescue Metals (FMG) +0.67% Quarterly update. Costs increased to US$13.51/wmt in the March quarter thanks to tropical cyclone Veronica impacting volumes. The company now expects FY shipments of 165-170mt with C1 costs between US$13.00/wmt and $13.50/wmt. Sydney Airport (SYD) 0.54% March traffic performance showed international passeneger numbers dropped 3.8% on pcp, while domestic travellers fell 3.4%. Numbers were affected by the timing shift of Easter and Lunar New Year driving. South 32 (S32) –0.57% Quarterly report. Alumina production is down 3% from last year to 1,201kt. Guidance for FY19 unit cost remains unchanged. Net cash has risen 7% to US$726m despite an increase in working capital. The company is also on target to meet FY19 production guidance at Illawarra Metallurgical Coal, while production guidance at the South Africa Energy coal has been reduced 9%. 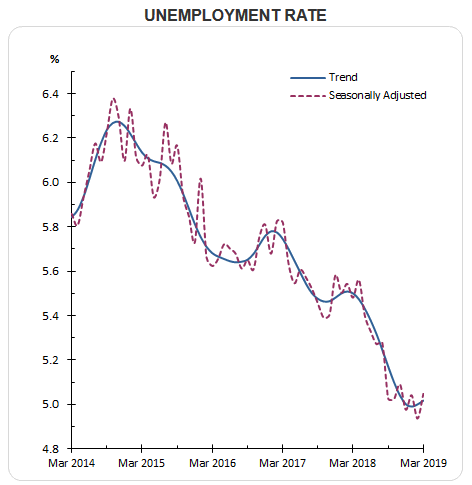 Australia’s seasonally adjusted unemployment rate edged up to 5.0% in March from a near eight-year low of 4.9% in February and matching market expectations. 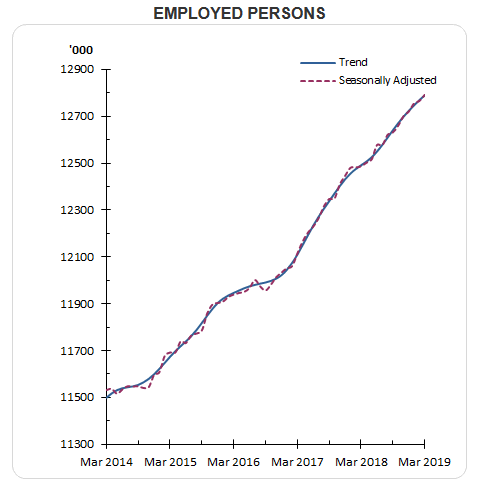 The economy added 25,700 jobs, while the number of unemployed increased by 17,100 to 680K. There is an economic theory that a country’s economic activity can be better measured by the sales of Lipstick. L’Oreal is the queen of lippie. It reported Asian sales up 23% outpacing the Euro zone for the first time ever. LVMH has also reported record handbag sales. No wonder a family can fund the Notre Dame rebuilding. The Mueller report will be released this weekend. 400 pages of redacted text no doubt. The Pinterest IPO has been priced at US$19. 12% below the price ity achieved in a private trade two years ago. Zoom shares will be priced at US$36.Increase on the range from the previous day. Huawei has promised a US$600 5G phone. Happy Easter. Drive safe. Double demerit points.